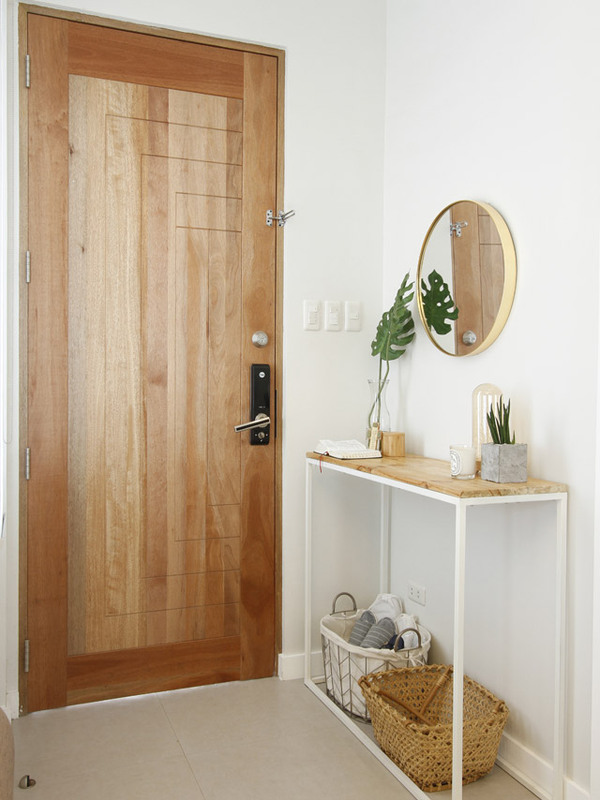 “Kailangan talaga may DIY because it wouldn’t be our home without a DIY piece,” the lady of the house shares. When it comes to designing and furnishing a home, it’s easy to fall into the trap of overdecorating or having a plain and boring space. This family home in Laguna is on neutral ground as it showcases a look and feel that’s homey yet practical—a picture-perfect aesthetic that’s balanced and easy to achieve. “We tried to build our house around the Swedish concept of Lagom, which translates to ‘not too little, not too much, just the right amount.’ We read about it and knew that it’s what we wanted for our home—everything in moderation. We also had to consider the needs of our son, who has cerebral palsy. 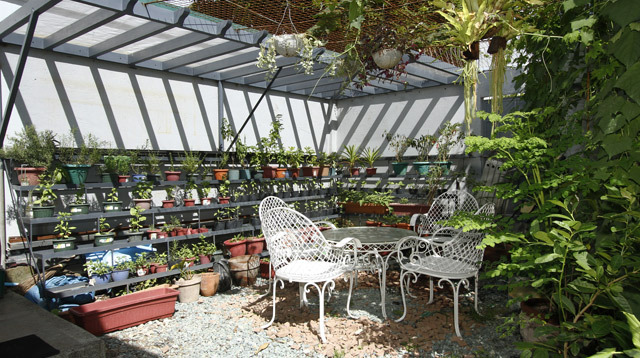 The house has to be PWD-friendly and generally maaliwalas,” says Dianne, who shares the 120sqm bungalow with her husband, Teddy, and their son, Elijah. After taking into consideration the needs of the family, the couple worked with an architect to finalize the design of the house. They chose to go the DIY route for the interiors, opting to be hands-on when it comes to choosing the finishing materials. “We even prepared our own mood boards and furniture layout before sitting down with the contractor. We personally chose each element and each one holds a story. Like when we look at this piece, we can tell a story about it, how we chose it, and where we bought it,” Dianne adds. Aside from having three bedrooms, 2 bathrooms, a powder room, and a garage, the house also has an envy-worthy outdoor area where a cabana, a pavilion, and a secret garden can be found. 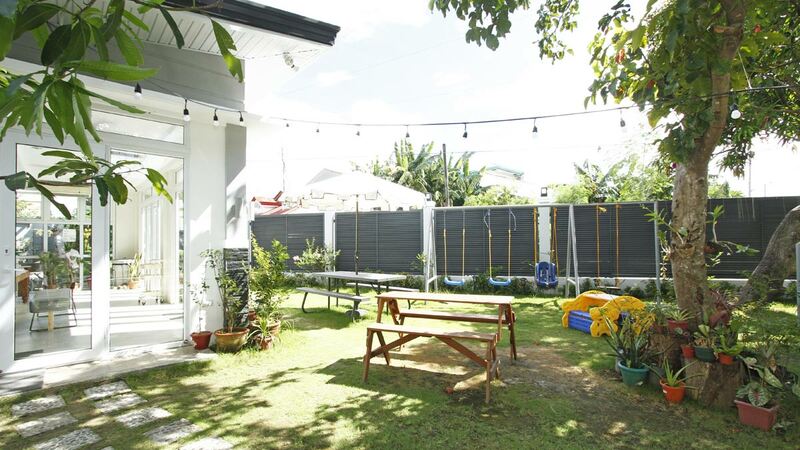 It’s an ideal setting for a family who loves staying in and having friends over. Would you believe they don’t have Wi-Fi, too? Aside from encouraging them to spend more time on other activities, the bold move also allows them to enjoy the house they patiently built to the fullest. 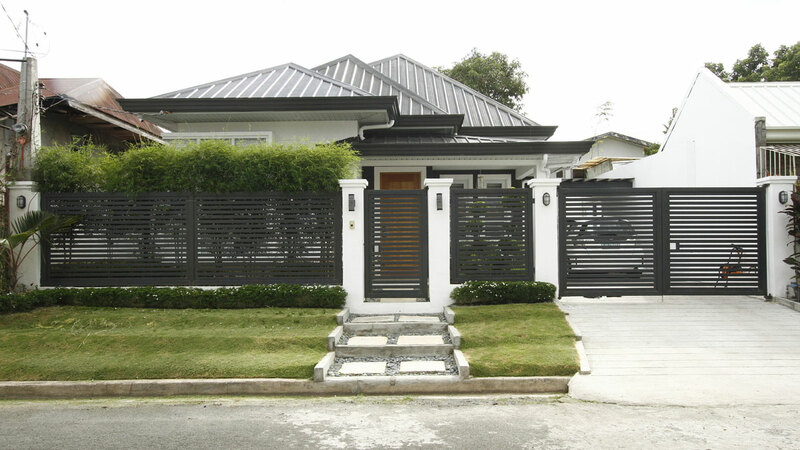 A modern gate fronts the simple bungalow, with plants complementing the neutrals dominating the property. 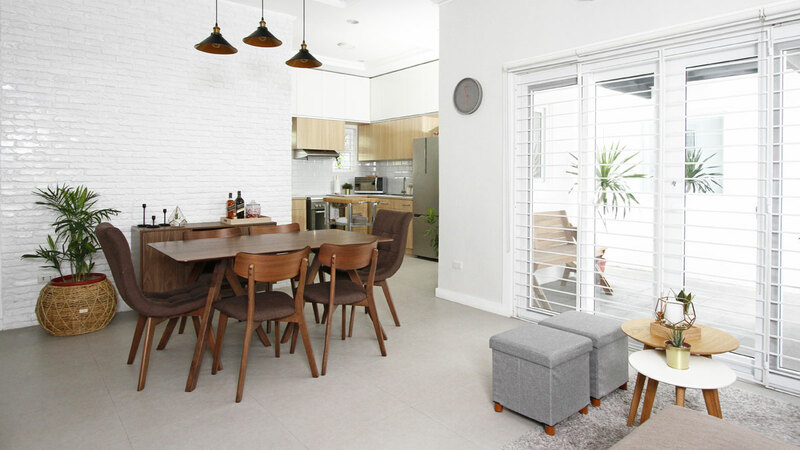 Given the things they want to include in the space, they had to focus on proper space planning to maximize the 120sqm bungalow. A sitting nook completed with potted plants livens up a corner near the front door and garage. “It’s a retreat from our busy lives. 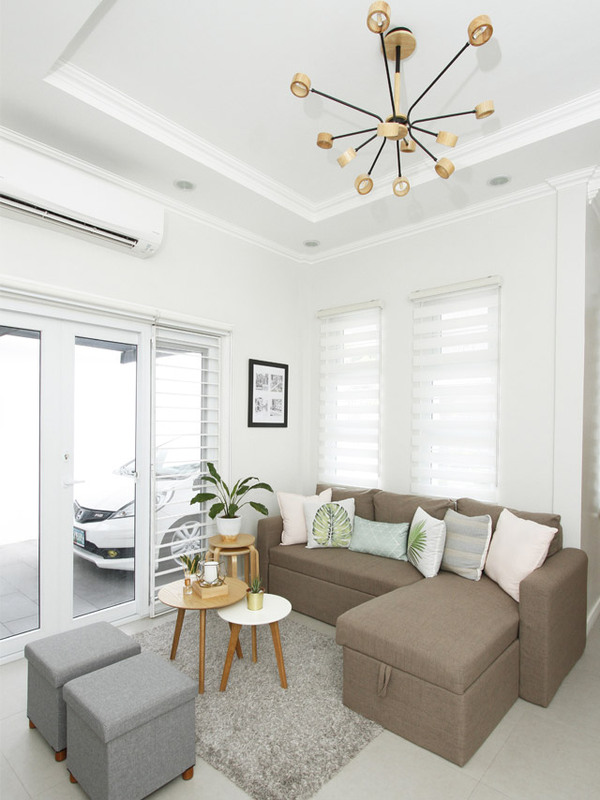 With bright and airy spaces, muted tones, and just the right amount of furniture and greens, you can’t help but feel calm and relaxed when you step inside,” shares Dianne. The home is special and unique because of the DIY pieces Dianne and Teddy created for the space. “Kailangan talaga may DIY because it wouldn’t be our home without a DIY piece,” the lady of the house shares. A slim console with wooden tabletop defines the entryway with plants, bins for footwear, and other accessories completing the look. “The DIY console is my favorite piece in the home. My husband bought the metal bar from a hardware store and we just asked a welder to build the frame. The tabletop came from an old wooden palette we had. I love how it fits the entryway and how it almost costs nothing,” she adds. The couple also made the cement plant holders. Find similar pieces at Mandaue Foam. Compact yet inviting, the living area is bathed in natural light. A neutral-colored shag rug anchors the space and ties the look the together. The sofa that turns into a sofa bed from Landmark makes the living area ideal for quick naps. Storage ottomans serve as extra seating pieces, while nesting tables hold different potted plants. The captivating lighting piece from a home depot matches the finish of the tables for a cohesive look. The living and dining areas share an open layout, adding to the airy and spacious feel of the home. 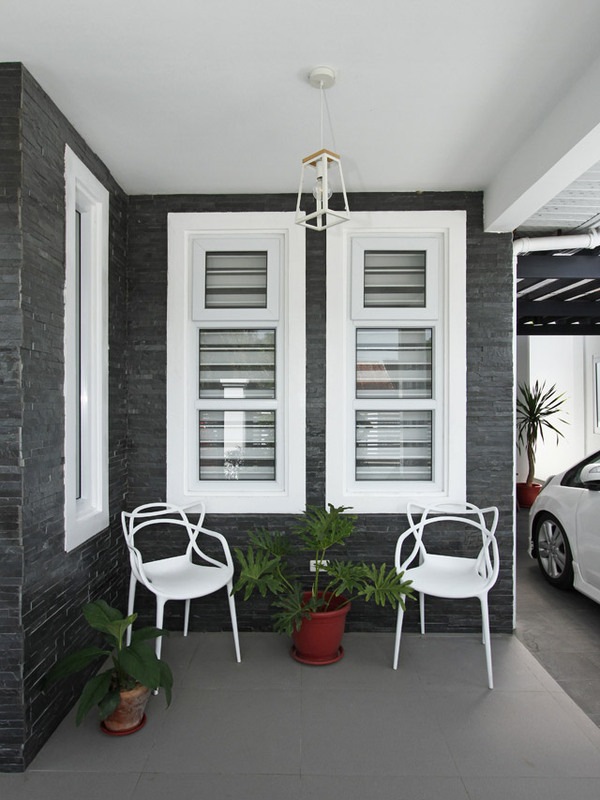 While some prefer to have plain white walls, the owners opted for white bricks to add texture and to keep the space from being boring. “In keeping within the Lagom principle, we tried to balance the aesthetics and functionality of the furniture we chose and the overall look of the house. We also worked with a neutral palette of white, gray, black, and wood for a streamlined look,” explains Dianne. The owners got the Mid-century inspired dining table from Our Home. To turn the four-seater table into a six-seater, they added two upholstered accent chairs on both ends of the table. Dinnerware and other entertaining essentials are kept inside the buffet table they got from Mandaue Foam. 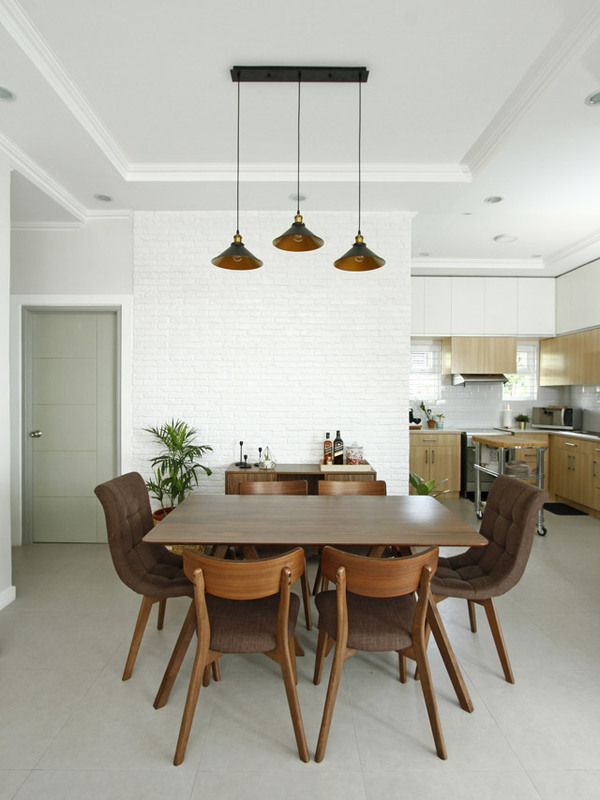 Chic pendant lights from a home depot add a modern feel to the area. A tiny freestanding shelf holds the owners’ collection of indoor plants. 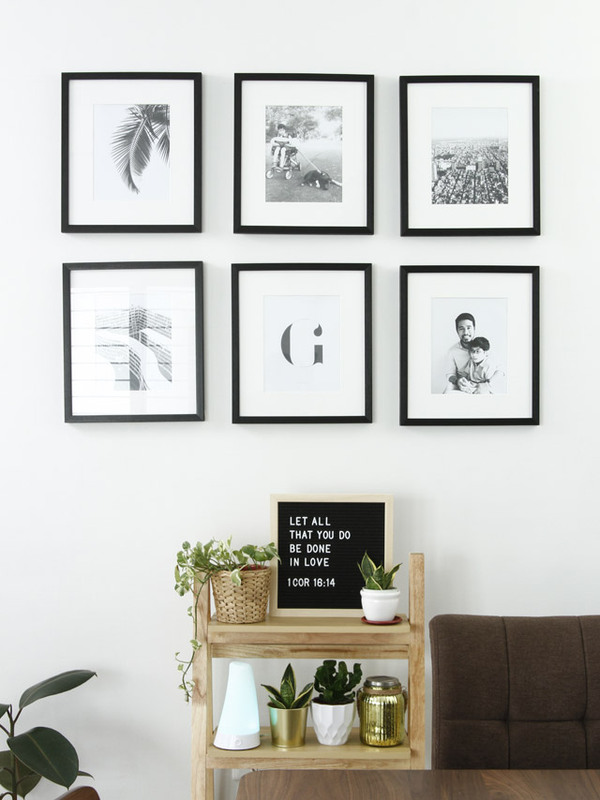 To keep within the simple yet posh look of the home, a series of black and white photographs in matching frames spruce up the wall. We’d double tap on this kitchen instantly—it’s pretty, functional, and perfect for whipping up delicious meals. 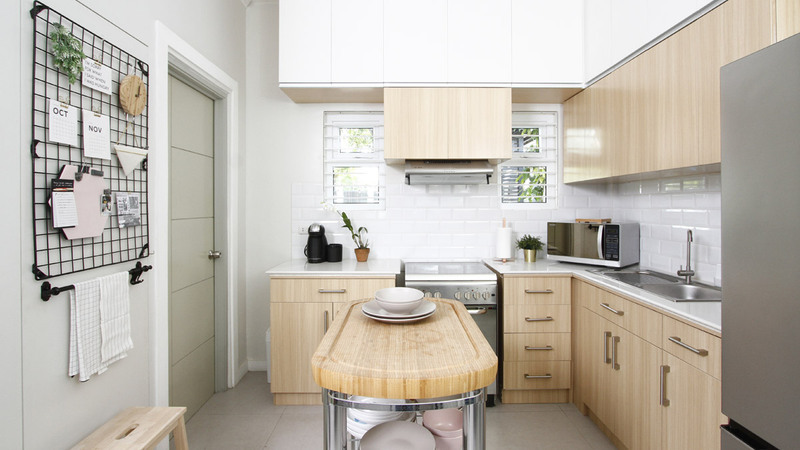 “We originally wanted to have gray kitchen cabinets but we saw the combination of wood and white subway tiles at Serenitea and we thought, bagay! We copied that look,” Dianne exclaims. They got the kitchen trolley from S&R to serve as kitchen island, it’s a plus that it matches the look of the cabinets. Even the step stool from IKEA (seen below the wire grid used as organizer) goes with the theme. Given the home’s high ceiling, they were also able to maximize the available vertical space by adding concealed storage above the cabinets. 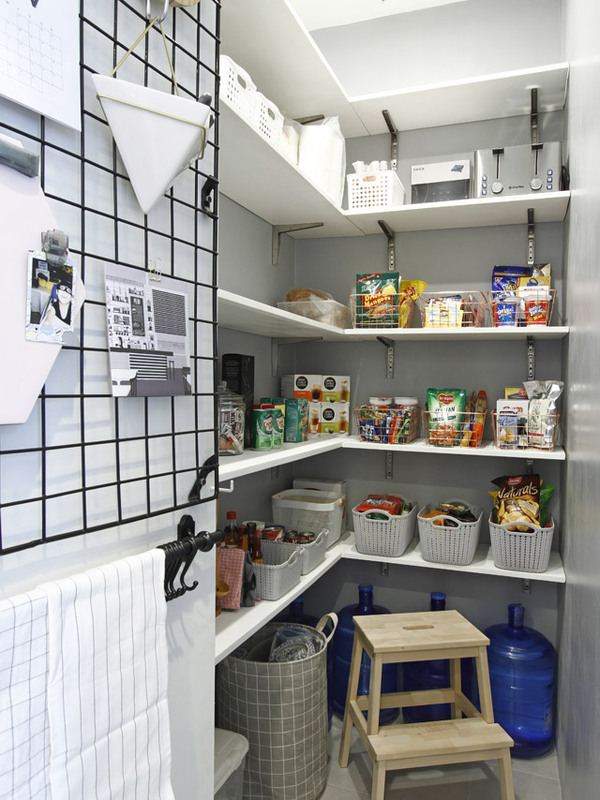 A concealed door leads to a pantry where the family keeps extra food supplies and other essentials. To liven up the wire grid from Handyman, they added accessories from Hobby Lobby, Landers, and Coop. “We identified the spaces that should be prioritized and adjusted the floor plan accordingly. We removed a breakfast nook for a walk-in pantry/storage,” shares Dianne. The serene master bedroom showcases gray walls, an inviting bed, and sophisticated furniture. The huge picture windows let in plenty of natural light, making the bedroom cozier and relaxing. Flanking the bed from Our Home are matching side tables from Furniture Source. Plants in different planters bring the feel of the outdoors in, turning the bedroom into a soothing escape. To be able to achieve a bigger bathroom for their son, Dianne and Teddy chose to have a smaller T&B. What it lacks in size, it makes up for in the finishes and fixtures. 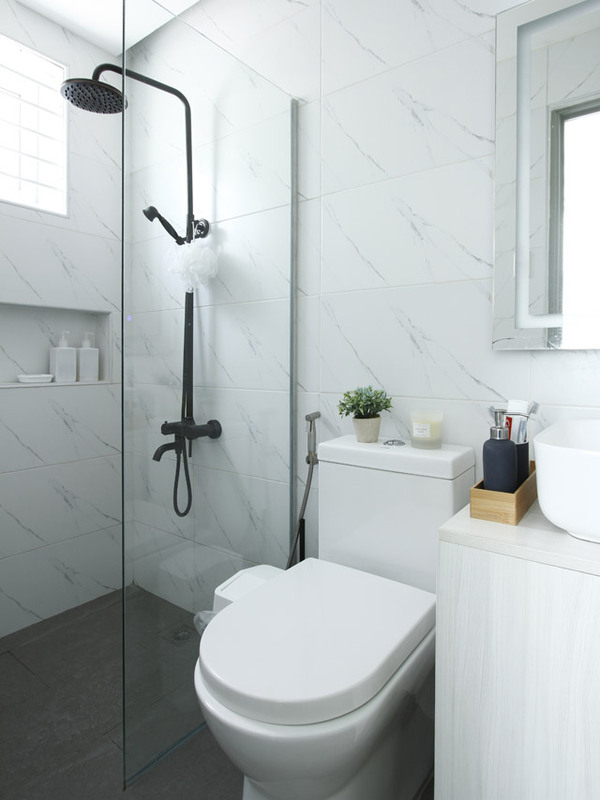 “The brass/matte black showerhead from Home Depot works well with the white fixtures and marble print tiles,” Dianne says. 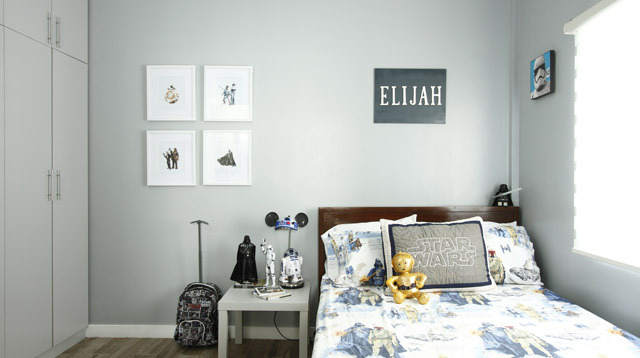 Neutral and spacious, Elijah’s room features essentials that showcase his love for Star Wars. “The force is strong with this room! 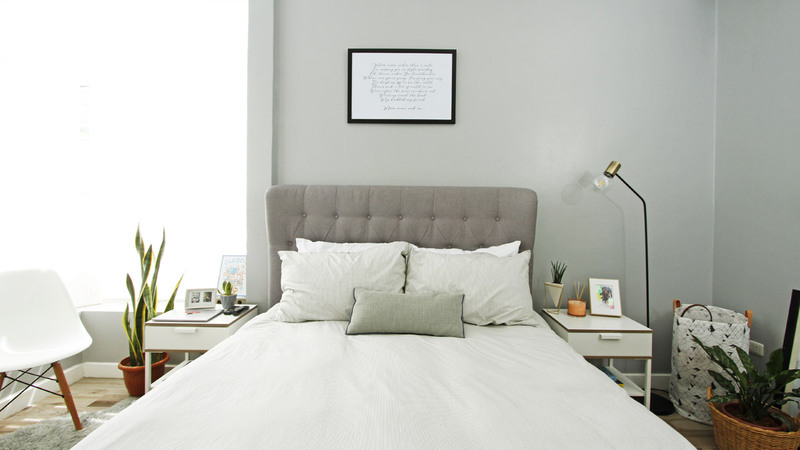 We chose a light gray paint combined with a dark blue accent wall at the foot of the bed,” Dianne exclaims. 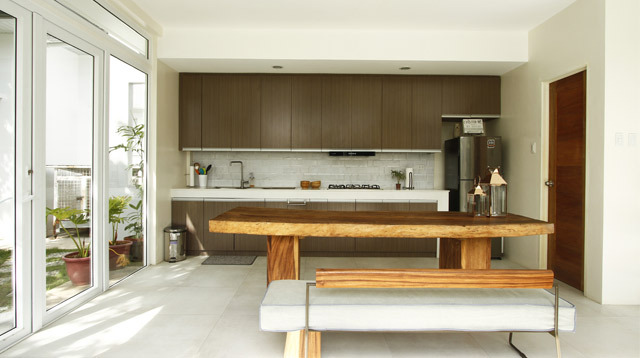 The color of the cabinet doors matches the walls to create a sleek and streamlined look. 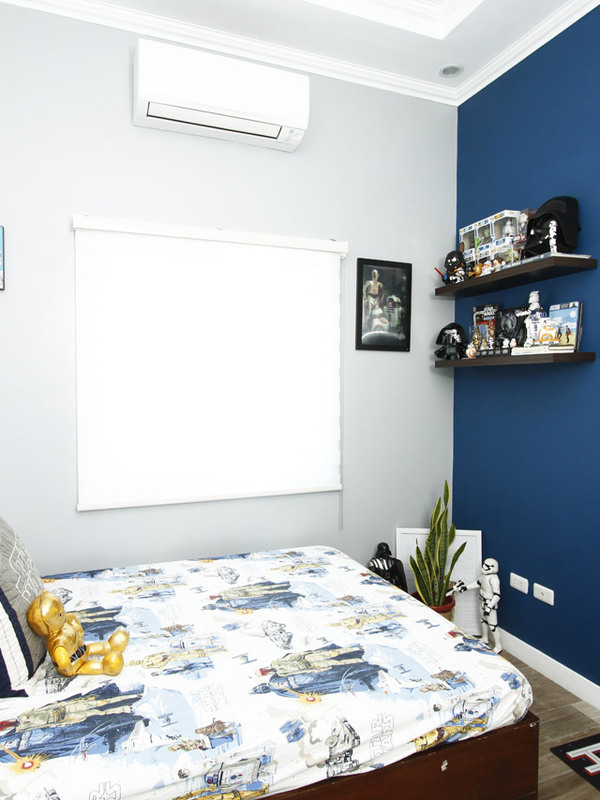 “The shelves hold his Star Wars collection and we got the printed works of art from Etsy,” adds Dianne. To save on costs, they reused a few pieces from their old home like Elijah’s bed. They dressed it up in Star Wars bed linen to match the room’s theme. Given the space, they were able to add tables for outdoor dining and parties. Kids can roam around and take advantage of the playset and swing set as well. 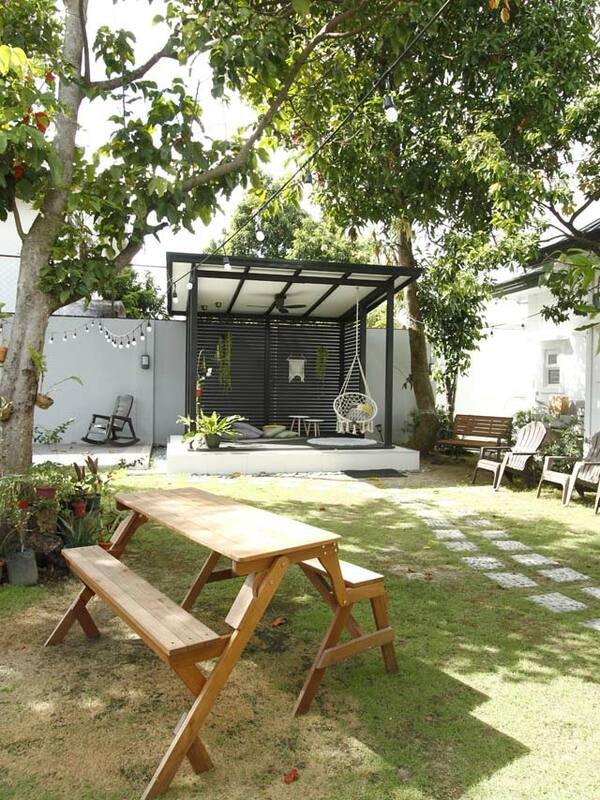 “The biggest bonus to our home is the pavilion and cabana at the back of the house. 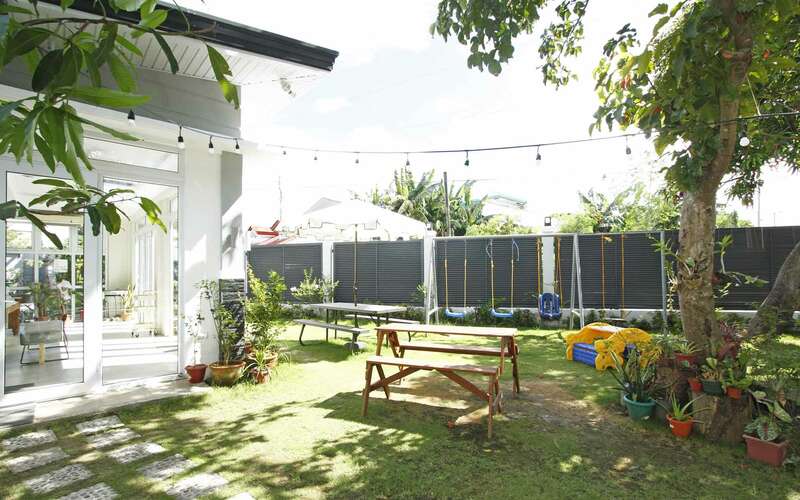 We have get-togethers every weekend so this is the perfect space for everyone,” shares Dianne. 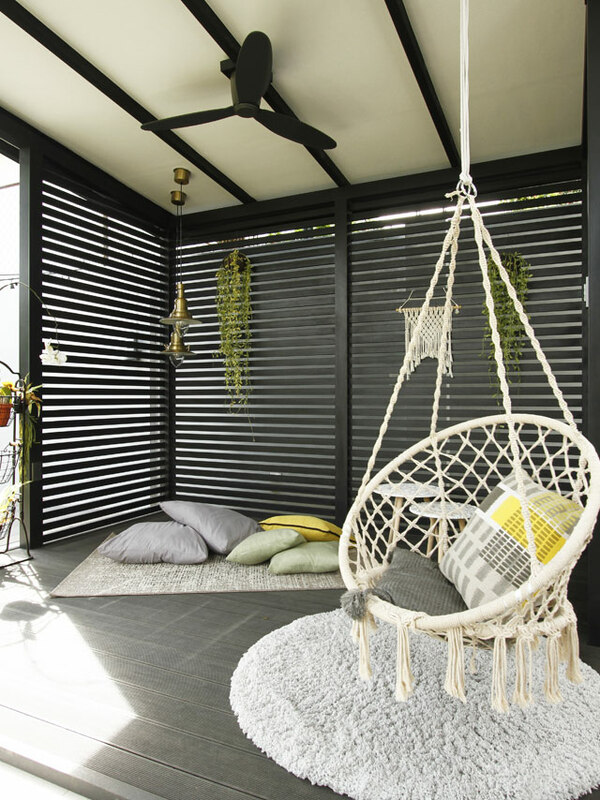 Designed by Dianne's sister, the cabana is a lounge area where one can read a book, relish the breeze, and take a nap. It’s a sweet escape where they can spend quiet time. To add to the homey feel, the owners furnished it with hanging lamps from IKEA, an area rug, a round rug, comfy pillows, and a macramé swing from Amazon. Black grills protect it from the elements. Dianne and Teddy can easily host get-togethers at the pavilion as it has its own kitchen and dining area. To spruce up the kitchen, they opted for print subway tiles as backsplash. The reclaimed wooden table is a hand-me-down piece from an old house. They paired it with a comfy bench seating from DAaz, allowing the family and their guests to gather around the table for meals and stories. Bar carts, indoor plants, and a console table from Pottery Barn complete the space. Dianne’s Dad plans to improve this corner so they can plant and grow their own vegetables. This nook is one of the current projects they are working on.